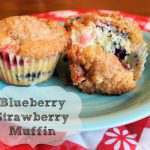 A simple Blueberry Strawberry muffin recipe to use fresh berries in. Perfect for guests or for any gathering. 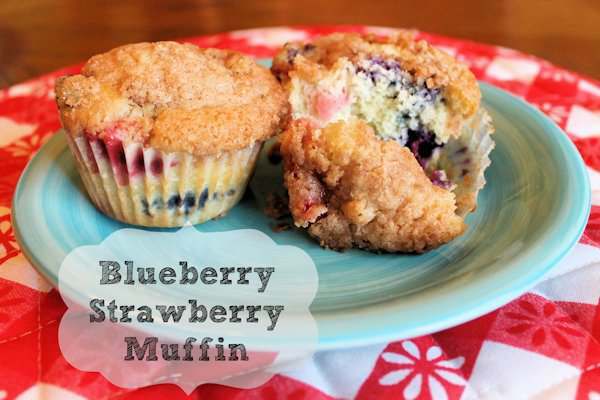 What I really love about this recipe is the berry’s don’t fall to the bottom of the muffin. The trick is to put your muffins in a bowl and stir them will a bit of flour. The batter is rather thick and that is what helps hold them in “place”. The topping on these is what really add that flavor. Just enough sweetness to make these a great muffin. A perfect time to make these now since its strawberry and blueberry season. Fresh fruit in the muffins. Preheat oven to 400 degrees F. Grease muffin cups or line with muffin liners. Combine 1 1/2 cups flour, 3/4 cup sugar, salt, and baking powder. Place vegetable oil into a 1 cup measuring cup; add the egg and enough milk to fill the cup. Mix this with flour mixture. Fold in blueberries and strawberries. Fill muffin cups right to the top, and sprinkle with crumb topping mixture. To Make Crumb Topping: Mix together 1/2 cup sugar, 1/3 cup flour, 1/4 cup butter, and 1 1/2 teaspoons cinnamon. Mix with a fork, and sprinkle over muffins before baking. These look really good – great for breakfast! Those look absolutely delicious. I’ll have to save the recipe for next time I’m making muffins. Wow, these look really scrummy, I’m going to have a go. Thanks fo rsharing, I found you on Blog Commenting Weekend on FB, hope to see you back on my blog soon. Oh, YUM! Thes look amazing! My picky kids would even love these. Great recipe! This will go direct to my Sweet & Bake board! Thank you for sharing this. Look delicious! I just made Orange Cranberry muffins this morning . . . these look even better! Will try them out next weekend! Those muffins look absolutely delicious and I think I already have all of the ingredients except the strawberries! Thank you for sharing with the Weekend Block Party this past week, we hope to see you there again this weekend!